A solution to commuter misery at Brighouse train station has hit the buffers with no funding or scheme to improve car parking problems in sight. The Calderdale District Consultation Sub-Committee of the West Yorkshire Combined Authority has revealed updates to station improvements in the borough being delivered through the Northern Stations Improvement Fund. However, there is no mention of schemes for Brighouse or planned extensions to the car park at the town’s station. Councillor Scott Benton (Brighouse, Conservative) said: “The lack of parking at Brighouse Railway Station is becoming more and more of an issue all of the time. “It is creating serious displacement parking issues on the streets around the railway station and is severely limiting the passenger usage of the station. “As councillors we continue to lobby the council to work towards securing funding for improvements. We are incredibly disappointed that no solution has been proposed as of yet. 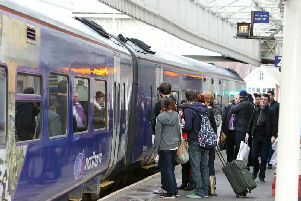 Within the Northern Franchise there is a Stations Improvement Fund of £38m. The majority of money is aimed at middle and smaller sized stations and is focussed on bringing facilities and standards up to a consistent level, looking at areas such as seating, information, lighting and security. Station investment will also include additional ticket machines and improved accessibility. Coun Howard Blagbrough (Brighouse, Conservative,) said the solution could be for a multi-storey car park to be built on the existing site. Stephen Waring, chairman of the Halifax and District Rail Action Group, said more could be done to tackle the problem of non-train users taking up the parking spots. “There are plenty of things that Brighouse station needs, including better train services, for which my organisation HADRAG continues to campaign. “Unfortunately there is very little for Brighouse in the Northern train franchise agreement so we are having to press the company Arriva for extra promises and so far they have not been very forthcoming. “Arriva have promised that Brighouse station will get partial staffing but we are still waiting to hear what that will mean in terms of passenger facilities. The train company hasn’t even told us when they are going to provide ticket vending machines. “On station car parking HADRAG has pressed the authorities over many years for enhancements. “Calderdale Council’s transport working group (of which I am a co-opted member) has certainly been pressing the combined authority for more parking at both Sowerby Bridge and Brighouse stations. “But it’s obvious to anyone there’s a problem at Brighouse. “Arriva as station operator needs to do more about people who are not train passengers parking at Brighouse station, taking up spaces that should be available for genuine users.